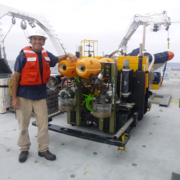 November 30 to December 5, 2018 – The Benthic biology and ecology group is heading out to study deep-sea communities in three different environments. 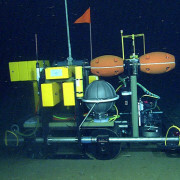 November 9-17, 2018 – The Midwater Ecology Group is measuring oxygen consumption rates of select deep-sea animals using a custom-designed tool, the Midwater Respirometry System (MRS). 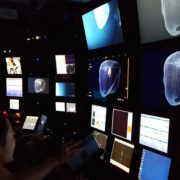 November 1-12, 2018 – The Zooplankton biodiversity group is working to answer questions about the biochemical, physiological, and genetic adaptations that ctenophores have evolved to help them survive and diversify in the deep sea. 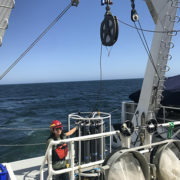 October 21-31, 2018 – MBARI Postdoctoral Fellow Amanda Kahn is aboard the E/V Nautilus, exploring the Davidson Seamount with the Monterey Bay National Marine Sanctuary. 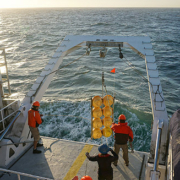 October 17-25, 2018 – The Pelagic-Benthic Coupling Group traveled out to Station M to service autonomous instruments that have been down at 4,000 meters for the past year. 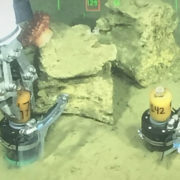 September 14 to October 2, 2018 – MBARI's Geological Changes group is studying submarine channels and seafloor faults offshore of Southern California. 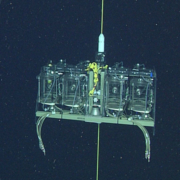 August 8-16, 2018 – The Midwater Ecology Group is measuring oxygen consumption rates of select deep-sea animals using a custom-designed tool, the Midwater Respirometry System (MRS). 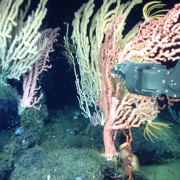 July 12-16, 2018 – MBARI bilogists recently completed a research cruise to study the ecology of deep-sea corals and sponges at Sur Ridge, off the Big Sur coast. June 21-26, 2018 – This research cruise is the first expedition of the Bioinspiration Lab on the R/V Western Flyer to study midwater organisms for bioinspired engineering design. June 5-11, 2018 – Large, multi-institution, CANON field experiment employs a wide range of technology to follow hotspots of biological activity.